As usually, lots to go over for this coming weekend’s finale. We know there’s a lot to read below, but please read all the way to the bottom. We know what’s going on but post this information so everyone else knows as well. Please make sure to use the hashtag #MontroseCX in all your social media accounts. 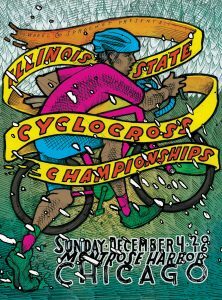 Ten27 Cycles and Spidermonkey Cycling jointly host the last stop of the 2016 CCC… the Illinois State CX Championships at Montrose Harbor… the 13th year at this location! We ask everyone to bundle up, bring your umbrellas, cowbells, photographic and video recording devices, etc and make a day out of Montrose. The Autobarn of Chicago, Evanston and Oak Park – Richard Fisher Dealerships. They will have Volvo and VW station wagons, ideal cars for cyclists, on site for you to check out. Wheel & Sprocket will have fat bikes on hand for you to test ride. The weather usually makes Montrose the special event it is. Right now the forecast is for low to mid 30’s and probably snow! The wind can also change on a dime, especially next to the lake, so bundle up, dress appropriately before during and after you race(s), and come prepared with extra warm & dry gear. Registration: We’ll be running reg the same way as every other CCC race. Please allow all 35+ racers to pick up their numbers first since they have to get ready first. Several fields are either already full or very close. Online waitlists are on BikeReg. After No-Shows are removed we put in the online waitlisted riders, then its first come, first served until we hit the field limits. Online pre-reg closes tonight… so if you’re not yet reg’d, do yourself a favor and reg now! Staging: Staging will follow the same protocol we’ve been using all season long in the series. See the procedure here which we have found is the fairest and simplest system for everyone. Preliminary staging will be posted here. Email us at ChicagoCrossCup at gmail if you have problems. State Champion Requirements: Ten27 Cycling, Spidermonkey Cycling, and the ICA will be presenting 20 Illinois State CX Champion Jerseys (on the podiums) to the first IL rider to cross the finish line in every category (excluding the 4/5’s). This means Junior 15-18, 15-16, 9-14, 9-12 Boys AND Girls, Women Cat 3, Masters 65+, and new this year Women Single Speed! Riders making it to the State Champion podium will be presented with gold, silver, and bronze medals. To win the Illinois state championship you must be a permanent Illinois resident (we’ll be checking state/federal ID’s), a US citizen or permanent resident, and hold a valid and unsuspended 2016 USAC annual license before the start of the race (yes, we’re looking at you Cat 4’s). There must also be a full podium of IL riders (that means 3) to win the state jersey. This should not be a problem in any category. In combined age groups, if a younger rider podiums in the overall category they take that place and are not replaced by any older riders finishing behind them. For instance, if a 16 year old wins the overall 15-18 race they win both the 15-16 sub age group and the 15-18 overall age group. This also applies to Women Cat 3 in the Women Cat 1/2/3 race and (in reverse) the Masters 65+ in the Masters 55+. In addition we’ll also be presenting race podiums (before state champion podiums) for all categories, including Junior 9-10 Boys AND Girls and the Cat 4/5‘s. So that’s another 23 podiums. If you haven’t done so already this year, find Kenny Labbe and thank him profusely for organizing everything so well. The Chicago Cuttin’ Crew and Pony Shop dads will be awarding Junior prizes and Junior sub age group and girls medals as they have been all season. Podiums presentations for each will be presented immediately after each race finish. The exception being the Junior 15-18 at 11:45am and the Junior 9-14 at 12:15pm. Speaking of results. While we, the USAC officials, and One2Go strive to produce results as quickly as possible, our first priority, especially since this is the state championship, is to produce accurate results and not have to revise and repost. We have to score everyone in each race, not just the top 3, and in order to do this we need your help with properly pinned bib numbers that are visible to the camera and officials at the finish line. Please read our explanation of what constitutes proper technique from our 11/15/16 post here. Payouts remain 5 deep per the 2016 CCC minimum payout schedule. Payouts will be distributed in the Registration tent after results are final, starting around 10:45. Payouts will also be distributed to Single Speed Women and Category 3 Women in the same amount as the Men. Men & Women Cat 1/2/3 State Champions will also receive dining cards for E.J.’s Place, so they can celebrate their victory in style. There will also be 8 pairs of Oakley Flak Jacket sunglasses awarded to the Junior categories. Wheel & Sprocket has also commissioned another poster by Jay Ryan for the event. The poster will be on sale at the race and all 3 riders on the podium of every state championship will receive a copy. While 6 riders have already locked up their CCC overall titles (see riders in yellow), there are still 9 very, very, very close categories still to be decided on Sunday, some categories still only separated by a few points. Overall titles will be posted Sunday, but all official overall series awards will be presented at the CCC Awards Party on Sunday December 18st at EJ’s Place. Details TBD and we look forward to celebrating with all of you. The Big Star food truck will be serving their famous tacos and other food at the curb between 11am and 3:30pm. A few series and race sponsor tents (SRAM, Mike Keating, and Nuun) will be gathered into an Town Square/Expo Area between registration, the finish area, and the podiums where the state champion jerseys will be awarded throughout the day of racing. Team Tents: Given the ever present potential for strong winds, bring weights and stakes. Also, Ten27 will have an expo area near registration with designated tent spots for race sponsors, so please do not set up your tents in these spots or you will be asked to move. Parking: As in years past tarking will be on the street only along Simonds Drive. That road will be closed to through traffic between the staging grid and finish line. You may approach the race course on Simonds Drive from either Wilson Avenue or from Montrose Avenue, but you will have to turn around and leave the same way you came in. Please do not park adjacent to the road closure barricades, as Ten27 is required to leave enough room for all cars to turn around at the barricades. Only authorized vehicles (i.e. officials, CCC staff, event organizers, BigStarTruck, etc) will be allowed within the road closures. Please do not give the traffic marshals a hard time about this, they are just doing their job. No Parking at all on the grass, anywhere, period (except for the SRAM NRS car). Team trailers: Plan to arrive early between 6:00-6:30am to park your trailer. The streets will be closed at 6:30am. Please drop your trailer and move the tow vehicle to the general parking area. We are trying to keep the barricade area as car free. It is possible to park your trailer Saturday evening by 5:00pm. Security watching the area overnight. Please contact the race directors through BikeReg to make any other special arrangements. Alcohol is prohibited in the park without permit, so please act appropriately and responsibly. Pack out what you pack in. A large trash dumpster will be provided in the street for any refuse. Another reminder about Bib Numbers: On your LEFT SIDE as always. All riders with longer hair are reminded that their hair MUST be pulled up and can not obstruct your bib # while racing. Riders are reminded to not sit up while coming across the finish line, this is especially noted for Juniors – wait to post up until AFTER you’ve safely finished and have been properly scored by officials. Numbers must also be clearly visible to the officials checking you in at staging. Failing to have numbers visible slows down and delays starting fields on time. One2Go Event Services will again be providing camera timing and lap times. However if your bib number is on the wrong side, you will NOT be scored. So pin those numbers correctly. If you’re not at the event or just want to follow along from the warm of your team tent head over to LiveLynxResults.com for real time updates. Since Montrose is the State Championship and the last race of the CCC series, the USAC officials will be pulling out-of-contention riders so the race leaders have a clear course. However, everyone will be placed, even if you are several laps down. The only way riders will be listed DNF (did not finish) is if they stop voluntarily. So keep racing until the chief referee tells you to stop. Riders will only be asked to exit the course at or after the finish line. SRAM Neutral Service will be in the equipment pits helping throughout the day in the case of a mechanical. The equipment pit is on the other side of the road from the start and finish lines. Please do NOT leave your spare bikes and wheels in the pit after your race. The next category needs to use the pit too. The Hot Tub CX Machine will be back again this year. The BBVP has asked that anyone who wants to receive “priority boarding” for the hot tub bring a canned food item for donation. Pay attention for a possible mannequin video before the start of the 4/5 race. The Course: Ten27 Cycling and Spidermonkey Cycling has tweaked last year’s course again while retaining most if not all of Montrose’s classic features while managing to find even more sand. The course runs clockwise beginning at the staging grid which will now be on the North East side Simonds Dr. The start chute will be longer than last year, and wide, and mostly without sharp turns. The finish line and registration tent will be in nearly same location as years past, just off the road to the North and near the sand. The main sand section will of course be in play where the Hot Tub will be set up. As always the final course track will be determined Saturday afternoon and may be altered from the map below. If you’re getting a head start and going out to pre-ride the course, please give the folks out there setting up the course some room and maybe even give them a hand. Please NO GROUP PRACTICES on the course. We want to leave the grass in as good of shape as we can after Sunday so we can come back and race next year and the year after that and the year after that and the year after that… Thanks! Finally, if you are able to stay late and help tear down the course and pack everything away, please do so. The Cat 4/5 race finishes just as it gets dark and Ten27, the Spidermokeys, and the Cuttin’ Crew (all the equipment goes to Afterglow next) will very much appreciate your help. Will payouts be brought to the awards banquet? Stuck around but $ wasn’t available so just seeing the best way to pick it up. Thanks. Even the pros get off and RUN! It may not a running race but it is a race of efficiencies. Words are hard, and there are a lot of them, we were bound to get something wrong. I believe in past years the poster has been $20. Question in regard to the waitlist for the Singlespeed and Juniors 15-18. There’s a combined field of 100 riders. Currently there’s 3 juniors waitlisted and 7 singlespeeders waitlisted. Are the waitlists combined or separate for each category? For example, if a junior no shows would that spot go to a junior or would it go to a singlespeeder if the SSer pre-registered before the next junior? Thanks for the help!